Missing or damaged teeth can cause a range of problems, but dental restorations with crowns and bridges are an easy way to maintain your healthy, stunning smile. The expert team at Dental Studio at Rosslyn provides crowns and bridges at their convenient, metro-accessible location in Arlington, Virginia. If you need a crown or bridge, call or book an appointment online today. Crowns cover the visible portion of your existing tooth above the gum line. They create a natural-looking, protective shield for a severely damaged tooth that still has a healthy root structure. As the name suggests, a dental bridge covers the space left by a missing tooth. A simple dental bridge uses two neighboring teeth as anchor points and spans the gap in between with an artificial tooth. If there are no healthy teeth to serve as anchors, the team at Dental Studio at Rosslyn may use dental implants to secure a bridge. The skilled team at Dental Studio at Rosslyn most often use crowns to finish root canal treatments or restore a severely decayed tooth that’s too damaged to receive a filling. Missing teeth can cause an array of problems, such as misalignment and jawbone deterioration. If dental implants aren’t an option for replacing missing teeth, a bridge offers a reliable, cost-effective solution. Besides preventing bone loss and teeth from shifting, dental bridges help maintain proper speech and a healthy, natural-looking smile. What is involved in getting a crown or bridge? 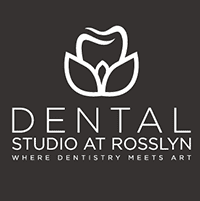 First, the team at Dental Studio at Rosslyn performs a comprehensive exam and discusses your best options for tooth restoration. They may take digital intraoral images and measurements of your mouth to create a customized crown or bridge that matches your natural tooth color. This process may involve multiple visits as the team prepares your teeth to receive the crown or bridge. When you’re ready, they permanently bond the crowns into place. To learn more about how a crown or bridge can repair your teeth, call or book an appointment online today.